As with last month, the poll again covers all three likely challengers to Barbara Boxer. It shows Fiorina 40/Boxer 46, DeVore 40/Boxer 46, Campbell 41/Boxer 43. All have a Margin of Error of 4.5. Running these numbers through my handy, dandy poll analyzer I get the following winning percentages: Campbell 41%, DeVore 25%, Fiorina 25%. Stunning, isn’t it? My instinct, and I think the instinct of most who look at a poll like this, would say that a shift of a couple points of voters would not be so much of a big deal. 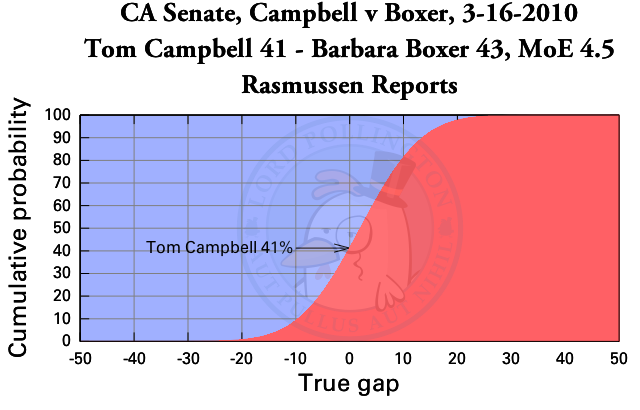 But as it stands, my model and this poll show Campbell with a 15% better chance of beating Barbara Boxer. And these numbers have barely changed from a month ago. Beyond the math, I have to conclude that Fiorina’s message has taken root. She has positioned herself from the start as a steadfast conservative, and her attacks on Barbara Boxer and Tom Campbell have come from the right. As a result, she polls equivalently with Chuck DeVore against Boxer. The voters seem to be giving her words the same weight as DeVore’s voting record. It has to be substance becuase it’s not name recognition that distinguishes Campbell from Fiorina. Take a look at the favorability ratings. While a full third of those polled have no opinion of DeVore, Fiorina and Campbell are nearly tied at 24% and 23% respectively. It’s not loathing of Fiorina’s record at Hewlett Packard dragging her down, either, because Campbell and Fiorina are tied at 15% very unfavorable. No, I’m convinced the issues are driving the polling in this race. DeVore runs on his conservative record, Fiorina positions herself as someone just as conservative, but Campbell is on the record as being to their left on key Republican issues like marriage and abortion. In a close race, winning a few points could be all the difference. It’s now up to California Republicans to decide whether Campbell represents them enough, and whether he will be able to tap into enough voter enthusiasm for the price to be worth it. She has to go along with a couple of republicans like Lindsay Graham (supports cap and trade) and McCain.